Every year, the Ciudad de la Alegria (City of Joy) organization in Cancun hosts the "Play and Lend a Helping Hand" Golf Tournament to raise funds for a noble cause: to help people in need discover their best opportunities in life. Riviera Cancun Golf and Resorts, one of the best golf courses in Cancun and the Riviera Maya, will once again host this event. Every year, the Ciudad de la Alegria (City of Joy) organization in Cancun hosts the "Play and Lend a Helping Hand" Golf Tournament ("Juega y Extiende Tu Mano Amiga", in Spanish) to raise funds for a noble cause: to help people in need discover their best opportunities in life. 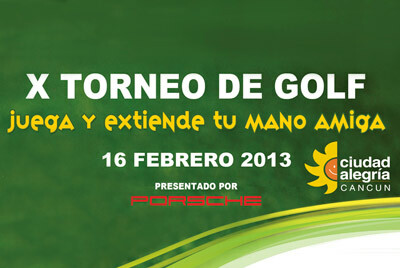 The 10th edition of this tournament will be held on Saturday, February 16, 2013. Golf first became popular when it reached London many years ago, and rules had to be created to keep players from breaking windows and hurting passersby. The sport was moved to large open areas that little by little transformed into the majestic green golf courses we know today. Grand Coral Golf Riviera Maya, one of the best golf courses in Cancun and the Riviera Maya, will host this event. Surrounded by the lush wildlife of southeastern Mexico and featuring an ultra-modern clubhouse, this course, located in the Riviera Maya, is the perfect setting for this elegant sport. You'll find all kinds of reasons to visit the Riviera Maya, one of the most popular beach destinations in Mexico and known for its incredible beauty. In addition to playing a round of your favorite sport, don't miss out on visiting of all the attractions this tropical paradise has in store. Take advantage of your free time by shopping on Quinta Avenida in Playa del Carmen, heart of this beautiful tourist destination, or a short distance away in the malls of Cancun, the most modern and cosmopolitan city on Mexico's Caribbean coast. Lie under the sun on the soft white sand beaches of Playa del Carmen, or take a tour of the surrounding areas; don't return home without exploring the wonders of this beach destination. With prizes ranging from trophies for the top three places to late model cars for holes in one, this event is sure to be a memorable experience. Playing a round while surrounded by the best Riviera Maya attractions will make this tournament, organized by Ciudad de la Alegria, a truly unique sporting event. If you're planning a trip to Playa del Carmen or the Riviera Maya, what better reason to play a sport that you're passionate about while contributing to the local population that supports this breathtaking place? Book your stay at one of the Playa del Carmen hotels or in the Riviera Maya and be part of this event. Sun, sand and sea will surround you as you strive to be the next tournament champion.